One of the constant preoccupations of the procrastinating writer using technology, is finding he perfect writing program. It’s been a long time since I gave up on the souped-up MS Word to be that tool, and moved to applications that focused on distraction-free, minimalist approaches. I also didn’t want to end up with all my writing in a proprietary format, even one so seemingly ubiquitous as .docx. For example, I’ve had my poems all archived in a FileMaker Pro database for a long time, but it’s been crashing a bit lately and I began to worry again about having all that writing in a format I couldn’t access easily, and through a variety of software. Hence, the argument for plain .txt files for poems that can be opened by a wide variety of programs. Text is unlikely to go away. Can output to standard file types: PDF, Word, etc. 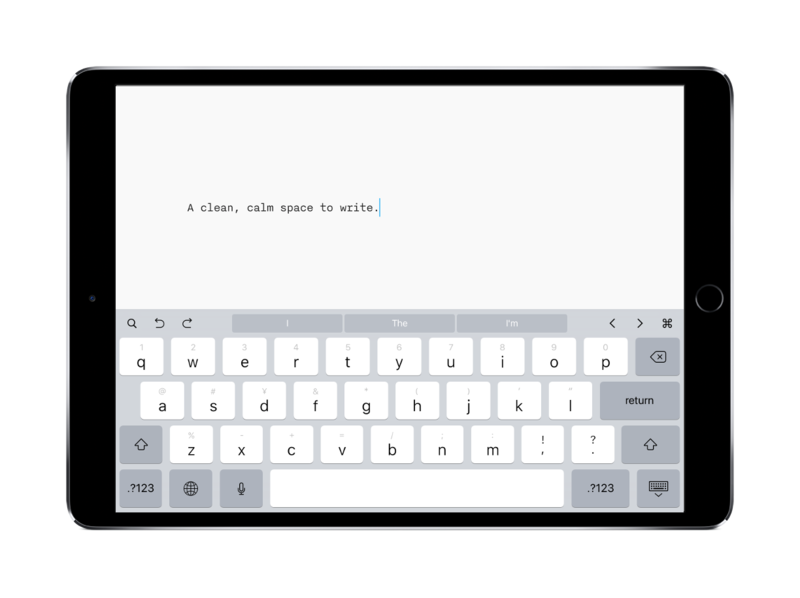 Can be used on iPad, Mac and iPhone using some sort of cloud-based architecture (iCloud, Dropbox) with the main aim being I want to be able to pick up my writing on any device and just take up where I left off. Has a kind of distraction-free mode so that I can focus on just the text on the page and not tons of tool-bars, windows, pop-ups and buttons. There’s a few that do most of these things, including Byword, but in the end I opted to go back to iA Writer, an app I’d enjoyed a while ago, and has come a long way since I last looked at it closely. iA Writer is simple to use and good to look at. It doesn’t paralyse you with a thousand typographical choices and can be driven with some simple keyboard commands giving you access to other files and folders (Ctl-E) and a preview of the markdown (Ctl-R) It saves in plain text and you can use markdown commands. All your files are synced in the background and accessible via iCloud syncing that seems to just work. There is some syntax highlighting which I only find vaguely useful (highlight adverbs in the current document and delete them all!) and quickly outputs to Word, PDF, and WordPress. For longer pieces, iA Writer isn’t perfect, and for those things, and particularly for the creation of Epub files, I’ve recommended Scrivener for a while now. Scrivener seems to be designed primarily for novelists and playwrights, and is a bit over-powered for writing individual poems, but ideal for putting together collections. I’ve used it to create ebook anthologies really successfully. But for most of my daily writing: poetry especially, but articles and reviews and long prose as well, I’ve settled on iA Writer as that well designed application that does what you want it to do, then stays the background and doesn’t demand your attention. Writing is always challenging, so anything that can help make the process more natural feeling, and more fluent, is welcome. This entry was posted in writing and tagged iA_Writer, Scrivener, software, tools by warrick. Bookmark the permalink.